Nathan Betts find great pleasure in bringing out the beauty of wood with its grain, texture and colors. As a schoolboy charged with helping his dad build furniture, Nathan Betts, owner of Final Touch Custom Millwork and BetzyWoodArt, admits he didn’t love woodworking in the beginning. He described it as being more like an arranged marriage commandeered by his father, Willard Betts. “My role was that of a helper – ‘hold this here,’ ‘pass the tool there,’ ‘sweep up the workspace,’” Nathan says. But he remembers with some fascination the wood shavings rolling off the hand plane and wondering if he could ever make them curl like his dad did. Father and son worked in a 5’ x 16’ side porch attached to their trailer in northern Quebec, Canada. It was just wide enough for a small workbench and shelves that held his dad’s hand tools, a skill saw, belt sander, and router. Custom woodworking is a major part of Nathan Betts’ business. The small shop wasn’t insulated, so it got cold at times. Nathan still can see the disappointment on his father’s face when he forgot to bring in the glue overnight. It was frozen solid. “I was assigned to bring in the glue. Unfortunately, we had to buy many glue bottles before these projects were done,” he recalls. His dad, who ran a cleaning business, had a passion for woodworking. He made several pieces of furniture for the family back then – a dining room table and hutch, bedroom suite, chairs, and kitchen pedestal table – all of which are still used today. When his father sold his cleaning business in 1987, they moved to their hometown of Maniwaki and started a furniture shop. But as the demand for custom furniture dwindled, they began building kitchen cabinets to keep the business afloat. Nathan Betts uses wood masterfully to create kitchens of lasting beauty. Slowly, over time, Nathan began to foster his own love and appreciation for woodworking. He enjoyed working alongside his father during the summers and school breaks, taking rough lumber and machining it, working with it, and eventually creating something you use every day. Once after high school when his dad went on vacation, he put Nathan in charge of making an entire kitchen, installing it with a helper, and even collecting the payment. He completed everything before his dad returned. “Dad was pretty proud and thrilled to have trained me well enough to execute such a task,” he says. 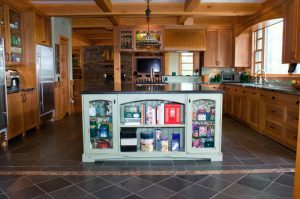 A kitchen design by Final Touch Custom Millwork. In 1993, Nathan had a change of heart about woodworking. Deciding he didn’t want to be a woodworker like his dad, he left home and moved to Toronto. There he bounced around from job to job. “It was from that moment on that I suddenly had this desire to do just that,” Nathan says with a smile in his voice. 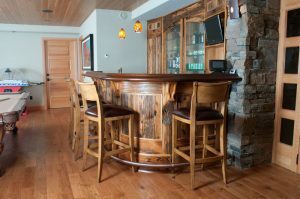 After working at a couple woodworking shops, he ended up in 2000 taking over the lease of one of his previous employers and setting up his own shop – Final Touch Custom Millwork. Later, Nathan moved to Mono, Ontario. 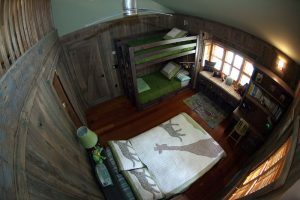 His dad soon joined him and together they built their shop where they created custom millwork and one-of-a-kind woodworks. Wood gives character to this bedroom by Final Touch Custom Millwork. Nathan has since come a long way from the little boy who wasn’t much interested in woodworking. He now finds great pleasure milling a rough piece of lumber and discovering within it the beauty of its grain, texture and colors. “I admire the beauty of nature in the wood itself. Transforming that nature into beautiful works of art creates the passion that keeps me going. It never gets old,” he declares. His passion for creating wood art led to his establishing BetzyWoodArt in 2011. It’s a name that comes from Betts as well as the name of a ski hill in Quebec where he took many a fall as a teenager. Nathan’s ‘wood art’ is just that – art objects made from wood, such as a sculpture or wall medallion. Or, as he describes the term, any wood object that tends to elicit a “wow,” but isn’t necessarily of a practical nature. “We were commissioned to do a piece for the Dufferin Child & Family Services Center (DCAFS) in Ontario. We created a decorative art piece that hangs on their wall. There’s no practical application to it whatsoever. But it’s strikingly beautiful in its shape, grain and its colors. The story and the people that inspired its design are what makes these works one-of-a-kind. They fuel my passion,” says Nathan. 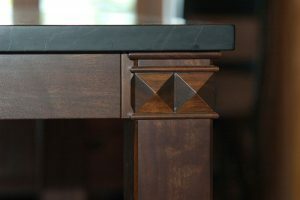 Jason Betts’ custom woodworking is distinctive. 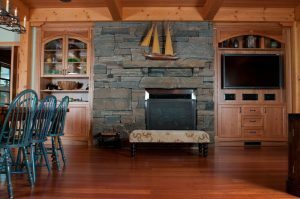 As the owner of Final Touch Custom Millwork, Nathan provides clients with residential custom millwork, custom furniture, and cabinetry. 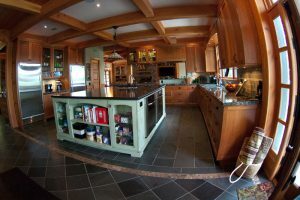 About 40 percent of his cabinetry goes into kitchens, though he also makes wine cellars, libraries, theater rooms, and built-ins. “We come into a home through a designer. Then we’ll bid on one element of the job. Once that job is completed, the client usually ends up wanting everything done by us,” he says. That’s one reason Nathan never advertises. Most of his business is through word-of-mouth and repeat business, with some coming from his listings of wood art on Etsy.com, an e-commerce website selling crafts and handmade items. 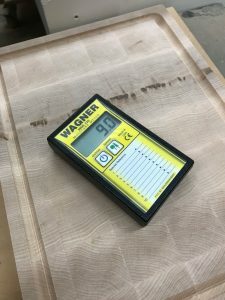 A Wagner moisture meter is an integral part of Jason Betts’ fine woodworking. One thing Nathan learned the hard way is that moisture measurement of his wood is critical. By failing to do so he once had problems with a finished piece. “Isn’t that how all of us came to realize we need a moisture meter?” he confides. 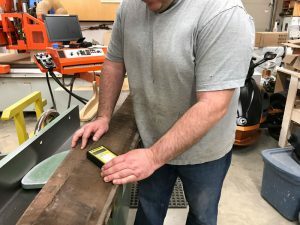 “If you don’t use a moisture meter, it’s going to affect your end product and the quality of it and the function of it, especially if you’re doing cabinet doors. Not having the right moisture means the wood will either shrink or swell and start rubbing or it will crack or warp. 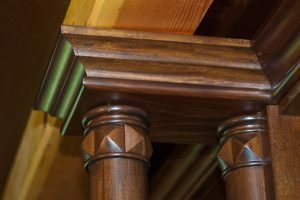 “It lowers your craftsmanship level a few notches if you’re not taking into account and controlling the humidity in the wood,” he adds. Early on he used a couple of pin meters, but he soon tired of having to replace bent pins, getting inaccurate readings, and punching holes in the wood. That’s when he researched on the Internet for a good pinless meter. He also talked to some wood flooring professionals. “I chose Wagner’s MMC220 moisture meter based on my research and what other people told me about it. In other words, it was the leading or best moisture meter on the market. Jason Betts knows that wood must be at optimum moisture content before crafting it if he wants to preserve his finished product. “This allows me to select the correct species so that it’s always accurate with the species I’m using. 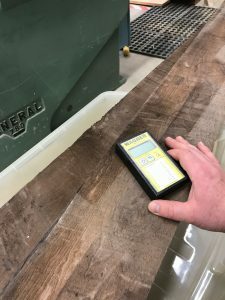 Because the wood I work with can range from a hardwood like dense maple to a softwood like pine, being able to select the correct species is very helpful,” Nathan says. Typically, Nathan aims for wood that’s under 10% moisture content (MC). While some woodworkers strive for 6% to 8% MC, he says it’s hard to always achieve that. “Based on my experience, anything under 10% hasn’t created problems for me. Once it goes into a house in North America, especially during winter when everybody’s got their heat on fully cranked, it’s not going to shrink that much more and cause problems as long as it’s below 10%,” he declares. To dry his wood, Nathan air dries logs in the yard surrounding his shop and runs some wood through a kiln he built. When the wood moves into his shop, he maintains a controlled environment of 40% humidity using a space humidifier. 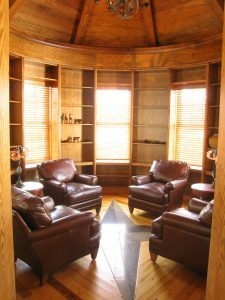 Jason Betts’ passion for wood creations is reflected in the warmth of this sunroom. Nathan prefers working with mostly domestic woods such as curly maple, cherry, ash, and walnut, but occasionally uses exotic woods such as Brazilian cherry. He also does a lot of work with salvaged wood reclaimed from old barns, fences, and train track ties. The reclaimed wood does have its challenges. For instance, wood reclaimed from a river may have undergone excessive stress, especially if it wasn’t dried properly. “When you run it through a jointer, especially on the table saw, it feels like the wood is just ready to blow up. If I cut one or two pieces that I ordered from a supplier and it’s like that, I’ll send it back,” says. Jason Betts always checks to see his wood is at the right moisture content before milling it. Nathan always checks the wood for its MC, but the meter doesn’t tell him whether it was dried under stress or how it got to a MC below 10%. Another challenge of reclaimed wood is having to deal with nails and other metal objects. But Nathan says he avoids 99% of the steel hidden within the wood running a metal detector and some strong earth magnets over the top of the wood. Wood brings out the warmth and character of this library built by Jason Betts. Nathan’s dad passed away in 2012 after battling cancer. But his dad’s lessons about woodworking live on. He learned that you could be the absolute best craftsman in the world, but if you don’t have the right tools for the job, then it either becomes impossible or extremely frustrating to do a good job . . . and that saps the joy out of your labor. 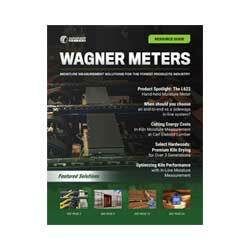 “I always buy quality tools, even a small tool like my moisture meter. Despite its size, it’s one of my most crucial tools because it tells me whether or not the wood is dry enough and ready to work,” he remarks. Jason Betts admires the beauty of nature in wood as seen in this fine workmanship. His dad also taught him to continually learn, to push his limits, and expand his craftsmanship because one is never done improving.